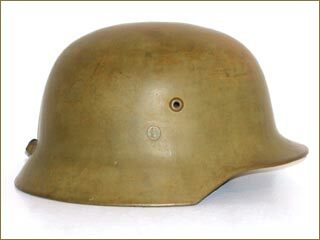 The Hungarian army in World War II used a helmet very similar to the German M-35. However it utilized a different liner system along with a different position for the bolts. 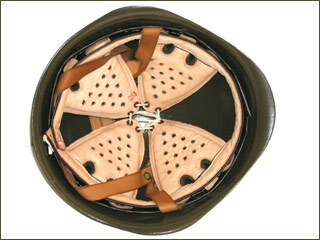 The helmet also features a rectangular hook on the back brim for attachment to a backpack. These helmets were issued in a variety of colors including light and dark green, light blue and the above mustard brownish color. 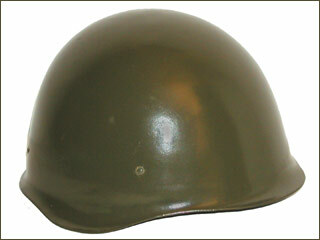 Many of these helmets were re-issued post war as the M-35-47 with retrofitted liners and a darker color of brown paint. This model were quickly replaced by the pro-Soviet government with a Soviet SSh-40 style helmet. 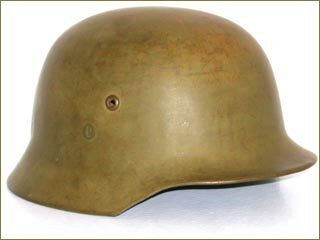 The model 1950 steel helmet is based on the Soviet SSh-40 design. The model 1971, which was also known as the M-65/80, was a later evolution with a four-pad liner and double leather chinstrap.